Ryan Walter played more than 1000 games over 15 seasons in the National Hockey League. 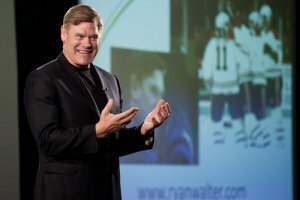 Drafted second overall by the Washington Capitals in 1978, Ryan was named the youngest NHL captain in his second of 4 seasons, played 9 seasons and won a Stanley Cup with the Montreal Canadiens, and returned to his home town to play his last 2 seasons for the Vancouver Canucks. He was named Team Canada Captain in the World Junior Tournament, was selected to play in the NHL All-Star game and for Team Canada in 3 World Championships, became a Vice- President of the National Hockey League Players Association, and was honoured as NHL Man of the Year. Ryan has been inducted into the BC Hockey Hall of Fame, the Burnaby Sports Hall of Fame, named to the 30 all-time Washington Capitals’ Dream team, the top 50 all-time BCHL players and the top 100 Montreal Canadiens in 100 years. Ryan has a Master of Arts Degree in Leadership/Business. He is the author of 5 books and an expert contributor to both online and print magazines, newspapers, radio, and television. Ryan serves on the Hockey Canada Foundation’s Board of Directors and is a member of the Seton Hall Stillman School of Business Leadership Advisory Council.